Diego Costa - Chelsea drastically reduce their asking price as they look to avoid potential fireworks in pre-season. According to reports, Chelsea have reduced their asking price by a reported £30-£35m for Diego Costa as they look to offload the striker as quickly as possible. He is now available for £50m this summer. I have to say I am confused and frustrated about this whole situation with Costa. However, out of respect for our manager, I stand by the decision he has made. In saying that, this is a very concerning time for the club because they are now stuck with someone the manager does not want and a player who only has eyes for one club who are unable to sign him until January 2018. 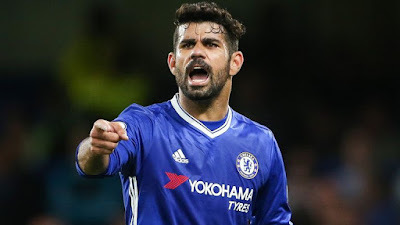 This has the potential to become a real drawn out affair and one we hope we can avoid but all the signs at present indicate that there will be a real stand off between Costa and Chelsea as the players return for pre-season next month. One thing I have really enjoyed about this season has been the real lack of drama outside of the pitch since Antonio Conte has come in. OK, we had the Costa issue back in January but apart from that, issues have been few and far between which has enabled everyone at the club and the supporters to just concentrate on the games. We spent years with all sorts going on and being reported when Jose Mourinho was here. Think back to all the times the club was dragged through the mud, all the press coverage which seemed to be constant at one stage and all the negative press, it was not a good time as Chelsea fans having to read all the crap and our dirty laundry being reported on and debated through the press/media. Under Conte it's been a drastic difference as Chelsea have been (for the most part) reported and debated in a positive light, received plenty of plaudits and have achieved the success they have without issues or dramas. That could all change with Diego Costa's insistence that he only wants to leave to go back to Atletico Madrid but is also aware that they have a current transfer embargo which prevents them for registering any new players until January 2018. With it being World Cup year, Costa as with any other player looking to make the selection for their national side wants to be playing as much as he can. Atletico would only give him six months to cement his place in the Spanish team which is a risk once the embargo is lifted. From the Chelsea point of view, they want rid of him and to have their new signings in place for when the team start their pre-season preparations. The problem is that I cannot see anyone wanting to take Costa and his wages for a six-month period before he can sign for Atletico unless another big name club comes in and tries to convince him to make a permanent move. So we could be left with a potential stand-off between club and player which has the potential to get more than messy here and it's something that we really need to avoid. Let's hope something can be sorted out quickly.